The doxxing of white supremacists who rallied to protect a statue of a loser general continues, to their shock. In turn, some of them are beginning to see consequences. 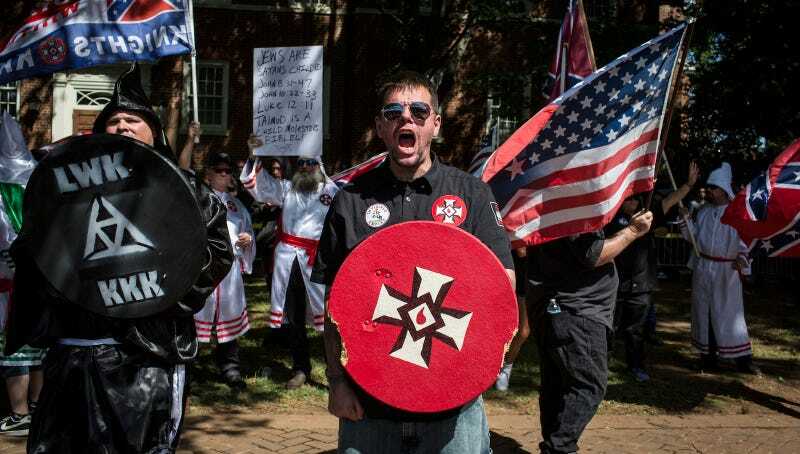 Twitter account @YesYoureRacist has been circulating photos of rally attendees who boldly eschewed the tradition of wearing a hood when one gathers in a mob to express vile ideology. Viral screaming racist Peter Cvjetanovic has already been exposed and reportedly regrets that he is getting attention, but that’s about all he does regret. According to the Independent, the message from alleged Anonymous members says it will shut down the site in 24 hours, which is exactly the amount of time allotted to them by GoDaddy. The site still has all of its other posts up, including links to places where readers can send money to fight the “Jewish terrorists” who want to shut them down. In the meantime, The Daily Stormer has attempted to get a domain on Google, but that registration has been rejected.